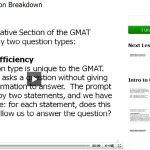 1) Veritas Prep GMAT app – Free app with lots of excellent free video content. The videos can be watched streaming or downloaded to your device. They have two instructors that you can actually see, rather than just a voiceover. There are many hours of quality content that come with the free version of the app; you have to be a Veritas student to get the full content. However, they’ve included lots of quality material for free. I highly recommend this app. 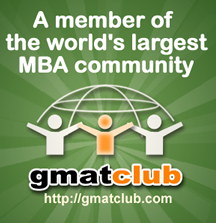 2) GMATClub GMAT Toolkit 2 – Comprehensive app with both free and paid ($30) versions. The free version comes with over 100 challenging questions from the GMATClub tests. The paid version has some cool in-app tools like an Official Guide Tracker and flashcards. I’d definitely recommend the GMATClub questions that come with the free version of this app – they are realistic questions that have been extensively error-checked by the GMATClub community. I haven’t tried the paid version. 3) Magoosh Prep – Free version with partial video content available; full version available to paid subscribers to their course ($79 for full Quant access.) The app requires you sign up for a free trial at gmat.magoosh.com. Magoosh has high-quality video content and practice problems. I recommend this app but you might only be able to use it during your 1-week free trial. 4) Beat the GMAT flashcards – free set of 237 flashcards. The Quant flashcards seem to be quite limited and not that helpful. The Sentence Correction flashcards are better – there are 78 idiom flashcards that may be useful to review. 5) GMAT Pill HD – Free app with partial content available; full version requires you to buy the course. The lecture videos are very good. I’ve already written a more extensive review of this app. If you decide to buy the GMATPill, you can get a $40 discount off the $437 price by using promote code TUTORME40 when you follow this link. 6) Economist GMAT Tutor – Requires an account at gmat.economist.com (click here for a 7-day free trial and use discount code 15THEGMATUTOR if you wind up purchasing). Basically the same thing as their online desktop course. 7) Manhattan GMAT/ Learningpod Pocket GMAT – This app has a very user-friendly series of interactive flashcards, exclusively for the Quant section. 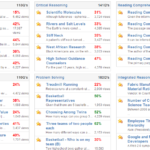 The app tracks your right and wrong answers by topic (algebra, geometry, word problems, etc.) Highly recommended. 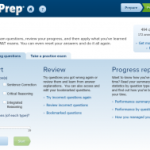 8) Arcadia Prep GMAT+ – It looks like this company just took some old GMAT material and threw it into an app. Not recommended.